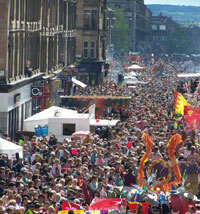 Glasgow has a wide and varied programme of festivals each year, including music, comedy, arts, and dance. Glasgow is home each year to the famous Celtic Connections festival of traditional Scottish music, the New Territories art and dance festival, and Glasgay, a celebration of queer culture. The Glasgow Film Festival presents an intriguing selection of films both local and international. And the Glasgow Comedy Festival is sure to tickle your funny bone. Glasgow has its fair share of street parades and carnivals, including the West End Festival, and the ever-popular Hogmanay Party in George Square in the City Centre every New Year's Eve. The Sandyford Hotel Glasgow can provide more information about which of Glasgow's festivals are running during your stay.